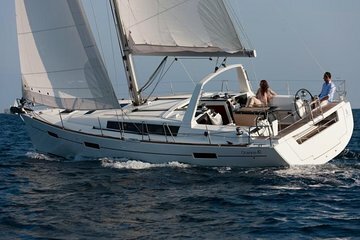 Auf dieser zweistündigen Tour in kleiner Gruppe von Barcelona aus segeln Sie vor der Mittelmeerküste. Fahren Sie mit einer neuen Luxusyacht entlang der Küste, genießen Sie den Blick auf die Skyline, genießen Sie Erfrischungen und tauchen Sie sogar ins Meer ein. Diese Tour beinhaltet mehrere Abfahrtszeiten, die Ihrem Zeitplan entsprechen. The picture posted of this ship was not the one we were put on. I was a bit embarrassed that I booked this because it is touted as a Luxury 2 hour sale with refreshments. They loaded us on the ship and handed the skipper a bag or refreshments. 1 beer in the bag, sodas and waters and 1 big bag of chips to share with the others on your ship. Luxury it was not. On top of this, they tried changing our tour time and to accommodate filling the vessel. I agreed to switch to a different venue since my times were not flexible. I expected a to be boarding the Motor boat instead as agreed, but at the last minute the tour had been changed back to a sail boat as they convinced two others from an earlier tour to join our 11:00 departure.. The sailing part was neat, but do not tell the others you are bringing with you that it is a luxury sail.. PS, they hoist the sails for 1/2 hour of this and run the motor for the rest of the time ..